Anyone who has been to a Hare Krishna temple for the Sunday Feast is certainly familiar with this tasty, fragrant Indian sweet. Let’s not confuse it with Middle Eastern halvah, which is also super tasty, but is rather different taste and texture. 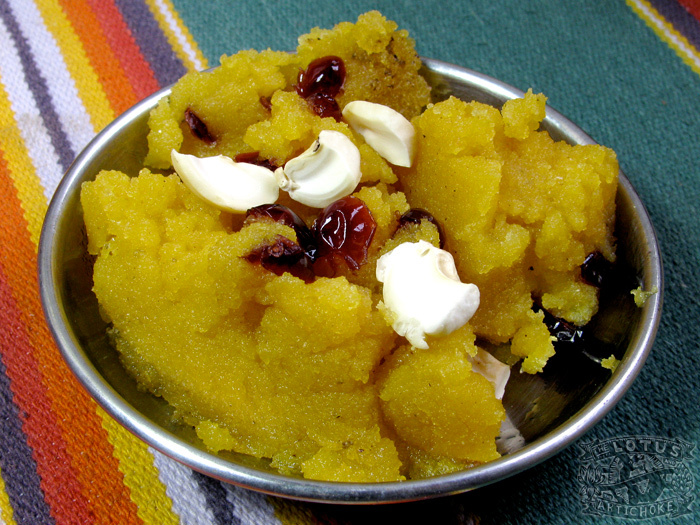 Indian halva is traditionally made with ghee or butter — however we can make a delicious vegan halva with good margarine. Oil works too, but it lacks the richer flavor. I love to round out a nice Indian thali with this treat served in a little metal bowl, like in the photo above. Free recipes straight to your inbox. Kickstarter 2: German Cookbook & English Reprint! The Lotus and the Artichoke goes to print! ©2012 Justin P. Moore - The Lotus and the Artichoke. All rights reserved.